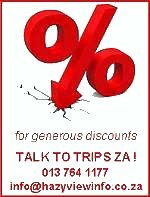 Trips ZA is a Central Reservation Office offering a free booking service. Hazyview is the ideal breakaway destination for the whole family. Our resorts and self-catering establishments offer fully equipped kitchens with outdoor barbeque / braai facilities and never-ending entertainment and fun for the kids. Situated on a 40-hectare property, 4km from Hazyview, with beautiful views and a dam for fishing. A 1km hiking trail through the bush leads to a magnificent river with views over Hazyview town. Eleven self-catering chalets and a caravan park and sleeps a total of approximately 50 guests. The pool area, which includes two trampolines, is fun for the whole family. Farm Tours. Quad Bikes allowed. Facilities of Kruger Park Lodge nearby. Located on a working citrus farm next to the Sabie River with an abundance of bird life. Two private cottages / rondawels and one log cabin. Air-conditioned and fully-equipped for self-catering with fridge, microwave oven, two-plate stove, cutlery, crockery and private braai area. DStv and en-suite bathrooms with a shower only. Secured with an electric fence and automated gate. Situated on the Kruger Gate road, 4km from Hazyview's CBD. Caravan park also available. 2-Bedroom, 6-Sleeper, fully equipped Self-catering Chalet with built-in braai/barbecue. The chalet is located on the golf course between the sixth and ninth green and features an open-plan living and dining area. Access to the Hulala Lakeside Lodge bar, pool, library and restaurant facilities. A luxurious self catering lodge accommodating individuals and groups of up to 24 people. Consists of main house, (sleeping 8 adults & 5 children), as well as 4 Chalets (each sleeping 2 to 4 people). Located 12km from Hazyview town on the R536 road towards Sabie. Two exclusive campsites are also available.